Valves are linear-lanceolate and distinctly dorsiventral. The dorsal margin is more strongly arched than the ventral margin, which is sometimes almost flat and sometimes slightly tumid in the middle. The apices are subrostrate, only weakly protracted, and tipped ventrally. The axial area is narrow. The central area is small and rounded. A single stigma lies at the end of a short median stria on the dorsal side of the central area. The raphe is lateral. Proximal raphe ends are weakly expanded and tipped towards the dorsal side. Distal raphe ends are hooked towards the ventral side. Striae are radiate near the valve center and then become parallel and finally convergent at the apices. Areolae in the striae are very fine and difficult to resolve in LM. This taxon is uncommon but widely distributed in small lakes, ponds and fens in the northern Rocky Mountains and North Cascades. In one of these lakes, Johns Lake in Glacier National Park, Montana, pH measured 7.2 and specific conductance measured 30 µS/cm at the time of collection. In Drosera Fen on the Indian Meadows Research Natural Area in western Montana, pH measured 6.8 and specific conductance measured 19 µS/cm. Krammer (1997) reports that E. neoamphioxys has a nordic-alpine distribution and prefers oligotrophic waters. Credit: Craig Weiland, Adventurers and Scientists for Conservation. Small tarn southwest of Bigelow Mountain, North Cascades, Chelan County, Washington: home of K. neoamphioxys. Cleve, P.T. 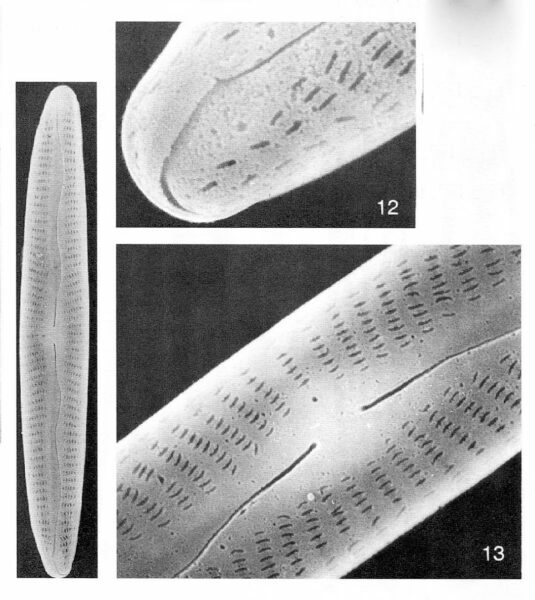 (1894) Synopsis of the Naviculoid Diatoms, Part I. Kongliga Svenska-Vetenskaps Akademiens Handlingar 26(2):1-194, 5 pls. Cleve, P.T. and Möller, J.D. 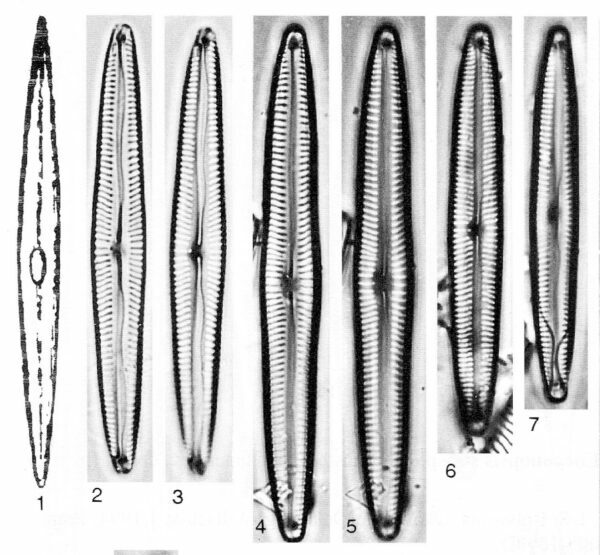 (1878) Collection of 324 diatom slides with accompanying analyses of A. Grunow. Parts 1-6 (1877-1882), Upsala. Krammer, K. (1997) Die cymbelloiden Diatomeen. Eine Monographie der weltweit bekannten Taxa. Teil 2. Encyonema part., Encyonopsis and Cymbellopsis. Bibliotheca Diatomologica 37: 1-469. 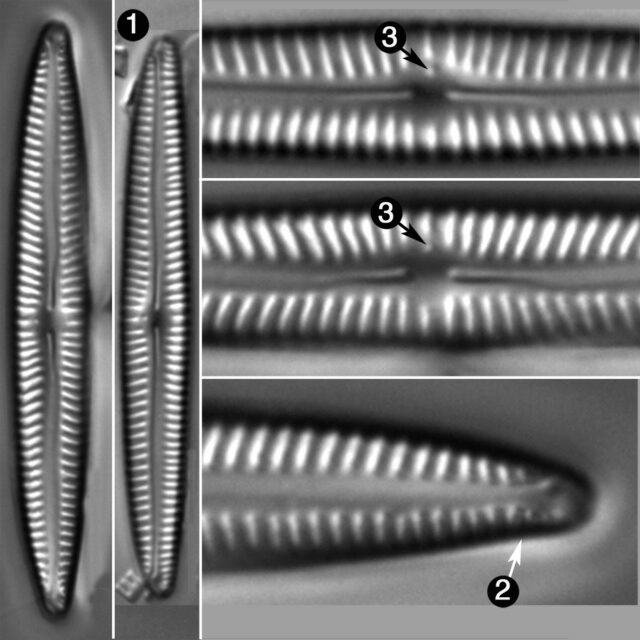 Encyonopsis neoamphioxys has distinctly dorsiventral and linear-lanceolate valves with weakly protracted, subrostrate apices. An isolated stigma is present at the end of the short median stria on the dorsal side.